LONDON--(BUSINESS WIRE)--Technavio analysts forecast the global CBD oil market to grow at a CAGR of over 31% during the forecast period, according to their latest market research report. The growing legalization of cannabis-based products is one of the major trends being witnessed in the global CBD oil market 2018-2022. Legalization of marijuana has emerged as a rising trend, which is influencing many nations to decriminalize cannabis and legalize the use of marijuana for recreational and medicinal purposes. Therefore, the prospects for the global CBD oil market look bright as many countries worldwide have begun accepting cannabis-based products and the demand for these products is increasing at a rapid pace. Millennials comprise the key demographic cohort among whom the medicinal use of CBD oil is quite popular. Also, the millennials are relatively more open to new experiences than the older generations, and therefore, are more likely to try out legal cannabis products like CBD oil. Thus, the rising millennial population around the globe is an encouraging sign for the global CBD oil market as they form the largest demographic group that consumes CBD oil-based products. The global CBD oil market research report provides market segmentation by product (marijuana-derived CBD oil and hemp-derived CBD oil), and by region (the Americas, EMEA, and APAC). It provides an in-depth analysis of the prominent factors influencing the market, including drivers, opportunities, trends, and industry-specific challenges. The Americas held the largest share of the market in 2017, accounting for close to 78% share, followed by the EMEA and APAC respectively. One of the key factors contributing to the increased sales of CBD oil in all these regions is a rise in the demand for CBD oil products due to growing awareness of their health benefits. 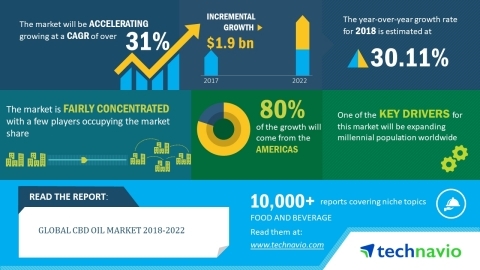 Technavio analysts forecast the global CBD oil market to grow at a CAGR of over 31% during the period 2018-2022, according to their latest report.